Teacher and staff visit booths during the convocation benefits fair. 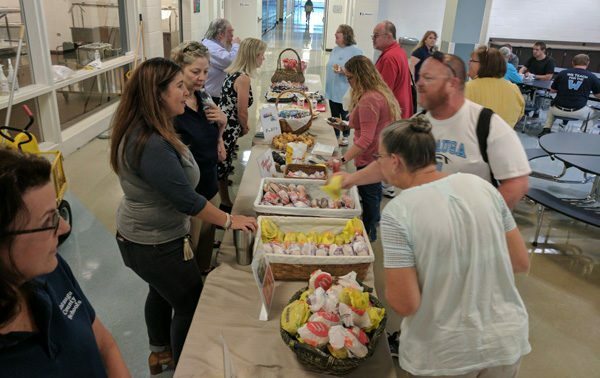 As Watauga County Schools prepares to open its doors to students Monday, Aug. 21, teachers and staff came together to celebrate the system’s annual convocation. Held at Watauga High School, the event gave WCS teachers — both new and returning — a chance to meet and connect with community partners, attend health screenings and a benefits fair and prepare to start the new school year together. Convocation featured three speakers, Watauga County Board of Education Chairman Ron Henries, WCS Principal of the Year Preston Clarke and WCS Teacher of the Year Eve Parsons. The trio spoke to Watauga County School’s mission to be the best place to learn and work in the state of North Carolina. WCS Superintendent Dr. Scott Elliott said that convocation was a great chance to bring teachers together from every school and to serve as a reminder of the driving motivations behind the profession of teaching. “I would like to encourage all of us here today, as we start a new school year, to reflect on our sense of purpose, to ask ourselves why. We could be teachers, bus drivers, maintenance and information technology specialists, or nutritionist, or office professionals, or any and all of our job roles – in almost any other work environment. It’s important to remember and to celebrate that this should never, ever be just a job.” Elliott said. Elliott continued the theme of making Watauga County Schools the best place to learn and work in North Carolina. He focussed on points he said would further that mission: Providing safe and modern learning facilities, offering a wide variety of education, athletic and extracurricular opportunities for students and ensuring that every child is welcomed, loved, challenged and supported to become their very best. Elliott ended by commending the assembled teachers and staff for their dedication to their chosen profession and to the students they teach. “I’m proud of all the options and choices and opportunities we provide to our students. And, I am proud that all of you have chosen, just like my family and I have chosen, to be here doing this important work,” Elliott said “We are all here, doing what I believe is the most difficult work, and the most important work, in our whole society and each and every one of us is doing this work by choice. Mabel School ELC adviser and tutor Patricia Sperry visits a booth at the convocation benefits fair. WCS Central Services staff serves breakfast at convocation.